I remember attempting to make peppermint slice quite a few years ago, when I came home inspired from a trip to my Aunty’s house. If she could do it, so could I. However, after a few more years experiance under my belt, I decided to try my luck again – and I’m so glad I did. 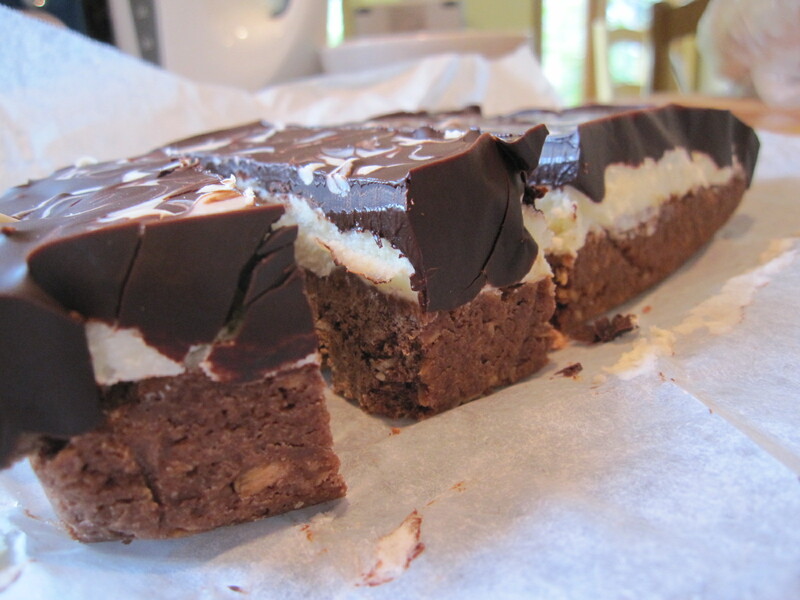 This was (and still is, seeing as it’s sitting in the fridge at the moment) the best peppermint slice I have ever eaten. I didn’t return to a recipe from my cookbooks, I googled for something better. 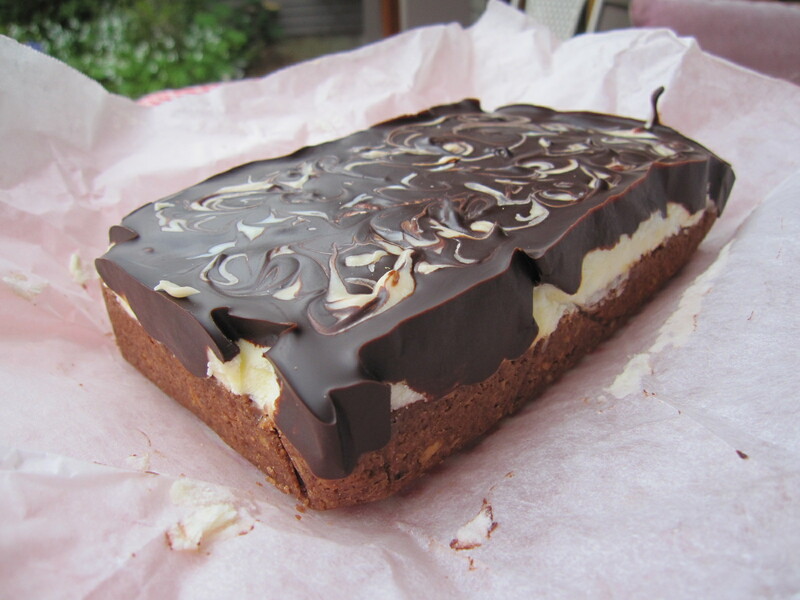 There was a cafe here in Christchurch that used to make the best peppermint slice, it was so different to all the others, the centre was like a thick heavenly mint fondant, not a gritty icing smear. I couldn’t work out how they did it, untill now. Cream and butter. Simple. Oh and there’s some icing in there too, but in short, cream gives it the more heavenly texture and taste. Now I can eat this whenever my tastebuds desire. Plus, having cream in the house gave me an excuse to make some fudge too. And we musn’t forget the base and topping. These too were a delight. Put the three together, and you have a minty slice of heaven. I even tested my decorating skills making lovely little white chocolate swirlies on the bittersweet chocolate topping. I also added about a 1/4 cup of cocconut to the base, just for added texture. I think mine even turned out better than the photo on the website, and it’s far better than the one in the cafe (; that’s what I call success – untill next time, happy baking ! Preheat the oven to 180°C. Line an 18cm x 28cm pan with baking paper. Cream the butter and sugar with an electric beater until the mixture is light and fluffy. Sift in the flour, cocoa and baking powder. Mix together until combined. Press the mixture into the base of the prepared pan. Bake for 20-25 minutes until firm. Set aside to cool. To make the filling, cream the butter and icing sugar until light and fluffy. Stir in the cream and peppermint essence. Spread the mixture evenly over the cooled base. Refrigerate for 30 minutes before topping with a layer of melted chocolate. Wait for the chocolate to set before cutting the slice into small pieces (for a perfect finish, use the tip of a sharp knife to mark cutting lines in the chocolate topping just before it sets). There is nothing better than waking up early in the morning, fetching some toast and then spending a good half hour pondering around food blogs. The only problem is it always makes me wish I was eating something better than toast. Hello and welcome to my blog, Sixteen Cupcakes. Finally, after being an avid food blog browser for years, I finally have a place to call my very own on here. A little about me to start off with, my name is Savannah (hello!) and I am 16 years old (hence Sixteen Cupcakes). 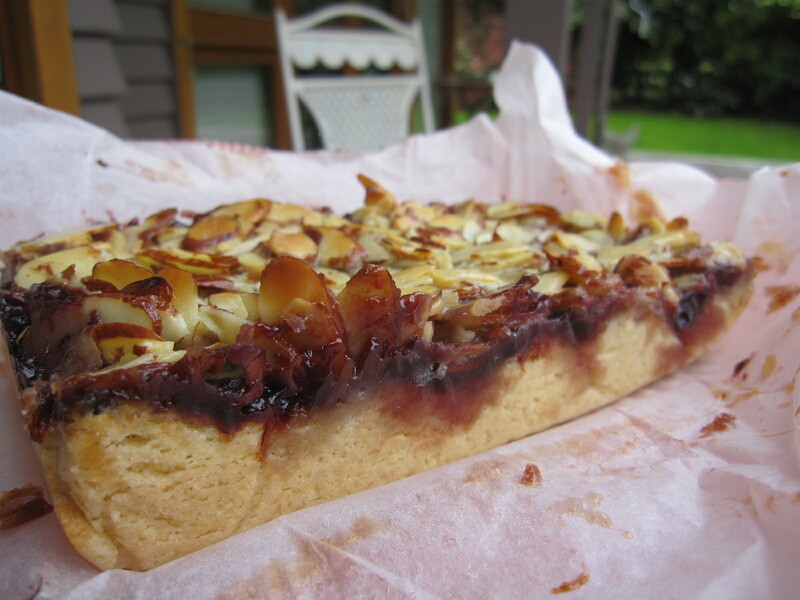 I live in the south island of New Zealand in the down-under corner of the globe – and I’m a passionate baker and food addict. Nothing gets me going more than food, cooking and baking – so, I have decided to share my baking creations with the rest of the online food community, and hopefully give back a slice of what it has given me. As my first post, I decided to share these Benedict Bars, which I found here, http://lisaiscooking.blogspot.com/2009/04/benedict-bars.html – Lisa is cooking’s blog . It is, one of the many recipe’s that have made me drool while on one of my morning blog browse sessions – I had to make it. Let me say I’m so glad I did. 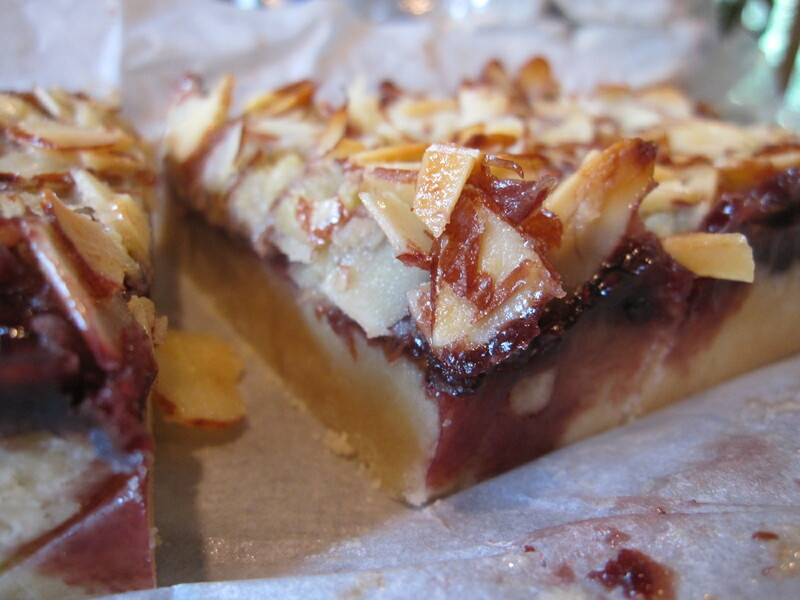 The shortbread crust melted into the tang of wildberry jam and the sweet crunch of the almond topping – I think you know where I’m going with this. It was perfect. Do yourself a favour and do try these, you will be so glad you did. Until next time – happy baking !